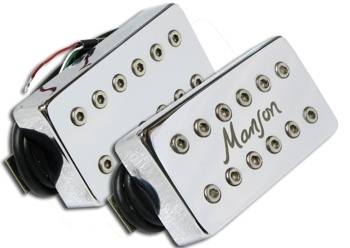 Manson’s and Bare Knuckle have carefully tweaked and tinkered to produce a pickup with a contemporary sound thats good for hard rock, metal, punk and all the other noises you pesky kids are into. The bridge pickup has three ceramic magnets buried under that handsome chrome cover and the neck contains an Alnico V magnet. Interesting contrast this and one that should be pretty flexible. You can pickup (ha, see what I did there?) a set of MBK-3s from Manson’s web site. They retail for UK £299 for the set.